The star-studded cast includes Sean Hayes, Will Sasso, Chris Diamantopoulos, Jane Lynch, Jennifer Hudson, Sofia Vergara, Craig Bierko, Stephen Collins, and Larry David. The movie is directed by Peter & Bobby Farrelly. Hey, moms…do you want to see the Three Stooges?? 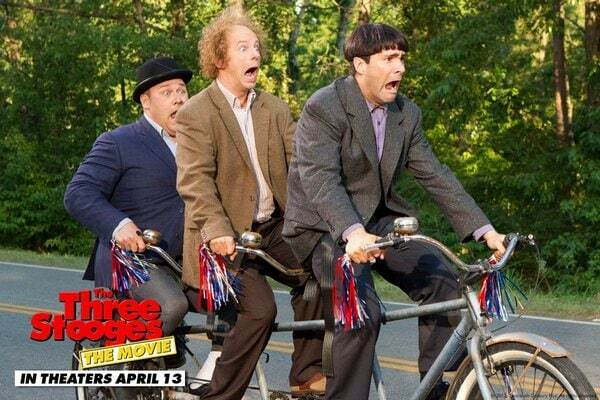 THE THREE STOOGES WILL BE IN THEATERS THIS FRIDAY, APRIL 13! Become a fan of LAB’s Facebook Page. Then leave a comment on the wall saying you entered the $50 Fandango Card and Tee From The Three Stooges giveaway. Tweet this message: “Hope I win @TheThreeStooges $50 Fandango & Tee giveaway from ladyandtheblog.com @verasweeney RT to Enter #contest #giveaway #ThreeStooges”. Like The Three Stooges on Facebook and leave a comment saying you are entering the $50 Fandango Card and Tee giveaway on ladyandtheblog.com. Leave a comment on this Three Stooges “Attention Mom” YouTube video saying you are entering the $50 Fandango Card and Tee giveaway on ladyandtheblog.com. I already subscribe to blog! Thanks! I left my email on the comment entry form. I fanned your Facebook page and left a comment on the wall as Sarah B. Follow Lady and the Blog on NetworkedBlogs.com. I am already a subscriber for LAB’s newsletter. and I posted on your wall! Like you on FB an commented about entering this giveaway there. Liked The Three Stooges on FB and commented there about entering your giveaway.. Follow Lady and the Blog on NetworkedBlogs.com-Jessie c.
I subscribed to LAB’s newsletter. From The Three Stooges #threestooges | Lady and the Blog <Liked it! having the same RSS issues? Anybody who knows the solution can you kindly respond? Pгetty! This has bеen a really wonderful article. Manʏ thanks foг supplying this infο.